It’s light. Definitely more light than I was expecting. I feel a bit disoriented. Where was I? My mind is slow to engage. I sit up and look at the view. Oh, yes… I remember now. The plan worked, sort of. I wasn’t cold, but there’s a heavy dew over everything. I pull my damp sleeping bag from the bivvy bag and stuff it back into the dry bag, hopefully for the last time. Today should be the last day. It was 4:00am, still overcast and barely light. It was my bowel talking. When you’ve got to go, you’ve got to go! I returned several minutes later and Andy was shuffling out of his bivvy bag. Kenny was still fast asleep, but he needed resupply in Ullapool, so was going to have a lie-in. We were away pretty quickly, dropping into Ullapool as the lorries were pulling out of town having collected last night’s catch of fish. We span up the road taking a breakfast of sorts on the move. 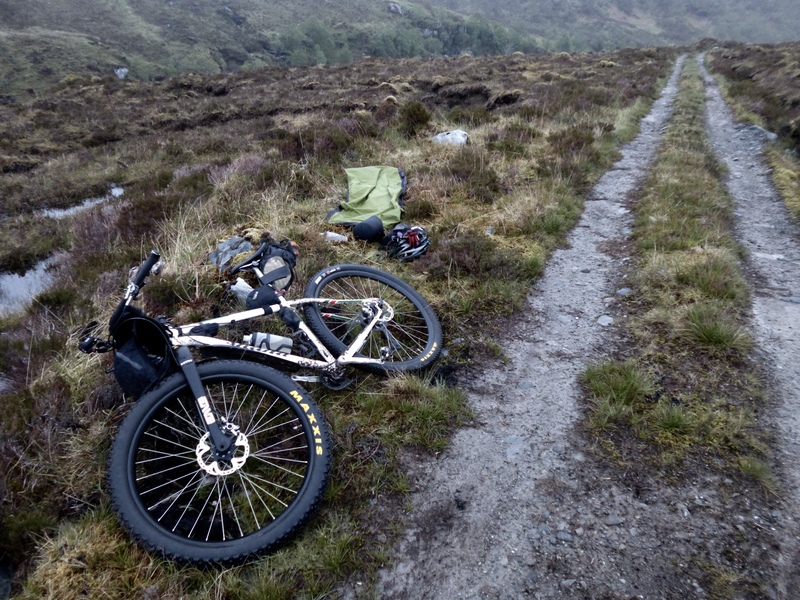 No resupply in Ullapool for us, but with what I had with me, I figured I’d be OK. At the end of Loch Broom, we picked up the Coffin Road – a steep and unforgiving push over to Dundonnel. Alan Goldsmith caught us up here, after his overnight stop in Ullapool. We chatted briefly, and Andy said how hard it is to keep up with his planned daily schedule, and declaring that he planned to do 90 miles today. My eyes flickered open at the sound of tyres rolling over gravel. It was light. I looked round but couldn’t see any sign of anyone. Maybe I was dreaming. The wind had dropped, and the midges were out in force. Breakfast would have to wait. In conditions such as these, I was glad I had my sleeping set up well dialed. Everything was centered around a single 5 litre dry bag that mounted into my Wildcat Lion harness, and it wasn’t long before I was up, packed and back on the trail. It was 4:45am. Hopefully by now, the Highland Trail doesn’t need much of an introduction. It’s in Scotland, it’s a chuffing long way, it’s very remote and you’re pretty much on your own. 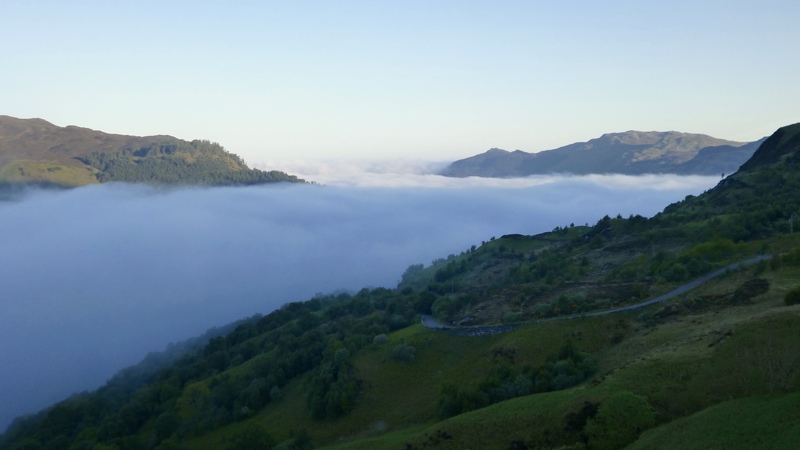 It’s also one of the most amazing multiday rides you can do in the UK. If you’ve been following the story so far, it’s been a mix of success and failure. It is more the latter than the former that has driven me back here for 2016, and that has been a strange motivator. “Right, you’re on pole!”, said Alan Goldsmith as I tried to blend in among the other 50 starters for this years group ride. “What, me? !” I said, somewhat surprised. Getting motivated to head out into the wilds of Wales can be difficult at the best of times. Like much of the rest of the country, the weather lately has been particularly appalling; the number of days without rain over the past two months could be counted on one hand. My coping strategy in these conditions was to head out infrequently and for short periods and spend the rest of my time indoors dreaming about all places I’d like to go on my bike when the weather was nice. “It depends”, I replied, before asking him how many times he’d done the event. Two days after the Rovaniemi 150 Arctic Winter Race, I headed back out into the wilderness with two fellow racers: Antti Sintonen & Evan Simula. Legs still tired from the race, we headed north-west out of Rovaniemi on some of the lesser-travelled snow mobile tracks, our ultimate aim to get to a laa-vu (traditional wooden Finnish shelter) beside the frozen lake at Sinettäjärvi. It was a fantastic ride in an amazing environment, made all the more enjoyable with the company of Antti & Evan – cheers guys! As I gathered together my bikepacking gear. But no matter, for this was really for training. To a land bleak and white and covered in snow. No finer celebration of fords could be reckoned. Riding into the wind was really a test. Progress would be easier if the wind would abate.